Ecclefechan, a small town in the Scottish Borders is famous for a few things, including being the birthplace of both the writer Thomas Carlyle and one Archibald Arnott, Napoleon’s doctor during his extended stay on St Helena, but also, and this is slightly more pertinent for a food blog, for the Ecclefechan tart, a rich concoction of butter and dried fruits in a pastry shell. The Ecclefechan tart isn’t a very common sight, at least outside Scotland. Sainsbury’s attempted a revival a few years ago, with disastrous results after they tried to pitch it as an alternative to the Christmas mince pie, as if an alternative were actually needed. If I’m being charitable, I’d conclude that Sainsbury’s just got their marketing wrong…they should have just let the Ecclefechan tart stand on its own, not as an alternative to this or that, but as a very decent tart in its own right, which, of course, it is. The trickiest thing about this tart is the pastry shell. Pastry is one of those things that you’re either a natural at, or doomed to struggle with. I’m the latter, but here goes. Weigh 250g of plain flour into a big mixing bowl and add 125g of cubed butter and a pinch of salt. Rub the butter into the flour, trying to be as light and deft as possible…you don’t want to overwork the pastry. if you’re really rubbish at this, use a food processor to pulse the butter in, but, again, go easy and don’t overdo it. Add a 50ml slug of whisky (Scotch, naturally, none of this Irish stuff, or – heavens forbid – a bourbon) and very gently bring the flour and butter together into a pastry. Don’t knead it, just get to the stage where you’ve got a ball of pastry, wrap it in clingfilm and rest it in the fridge for half an hour. The tart needs a 25cm loose-bottomed fluted tin, buttered lightly. Roll out the pastry so that it will comfortably sit in the tin. If you manage to roll out the pastry and get it into the tin in one piece, you’re a hero. The rest of us shouldn’t be ashamed to patch their pastry cases together as necessary. Prick the pastry all over with a fork and line it with a piece of scrunched-up, wet greaseproof paper. That’s a great trick…scrunching the paper up makes it sit against the pastry far more easily, and the water keeps the pastry moist as it blind bakes. Fill the pastry case full of uncooked rice, baking beans or whatever you use for this purpose and bake it at 180c for ten minutes. Carefully remove the greaseproof paper and everything in it and return the naked tart to the oven for another five minutes, until it starts to brown slightly. While all of that is going on, cream together 150g of unsalted butter and 150g of light brown sugar, and then beat three large eggs into the mixture, one at a time. Pour in 150ml of double cream, mix, and that’s your filling done. Now, to assemble everything. Drizzle a generous tablespoon of black treacle over the base of the pastry case and scatter 300g of mixed dried fruit over it. 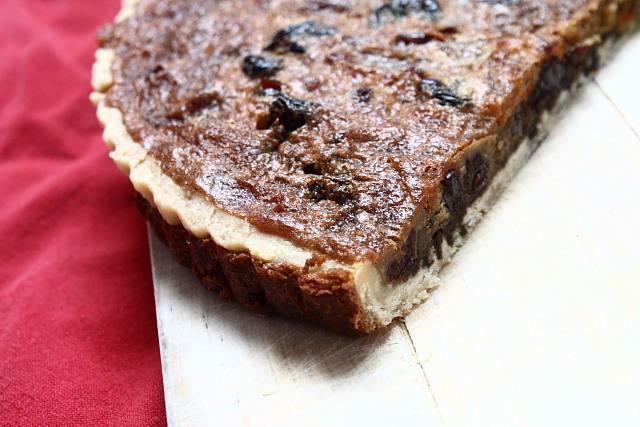 Use a good mix of anything that comes to hand – raisins, sultanas, cranberries, cherries, blueberries…. Add the zest of half an orange and half a lemon and pour over the butter and cream mixture, shaking the tin about to help it to settle into all the nooks and crannies. Bake for thirty to thirty-five minutes until the filling is set, but just wobbles a tiny bit. Allow to cool, but try some before it cools completely. , an indulgent view of British food in all its glory, with a great photo of five pints of Leeds Brewery beer on page 112. Thanks so much for this terrific post. I saw the recipe on the TV a couple of weeks ago and promptly forgot the name of the cake – it’s not too common in Australia! Wow, what an interesting dish! I’d love to try it, though I can’t say I’ve had anything similar. Lovely tart and nice sharing on how to go about making this tart. That gorgeous brownish filling is a so uplifting. This is a stunning tart! Looks great – right up my street. I’m a massive, massive lover of the hearty & rib-sticking when it comes to puddings. Never heard of it either! Sainsbury’s have made very good Eccelfechan Tarts for many years. I can’t wait to get them each Autunm. Can’t find the episode with tart on you tube , but it seems to me that it was served with a cream, scotch and molasses as a topping? Hi again Rich, you may recall our chats of some years ago. (Gary Gillman, Toronto). I’ve got a blog going now, and occasionally write on food, usually it’s about beer though! The ones pictured in your excellent article are flatter and more dense-looking than others I have seen from Ecclesfechan or Borders English, many of those resemble more closely ours which is small and slightly raised. In fact, yours are similar I think, or more so, to the one described in the 19th century source I cite and may therefore stretch back to the origins of butter tart/border tart/Ecclesfechan tart. Those were flattened and had pastry on top too but if one omitted the top layer of pastry it starts to resemble the flat pie-shaped version. Anyway our Ontario ones are very good, the first image in my posting is how I like them, where they run slightly. And I like currants best in it. The pastry should be flaky, not close-grained, and well, you should make the Ontario one (Anna Olson’s recipe is a classic version)! I’ll have to catch up with your posts, that guinea fowl one looked amazing! In what way was Sainsburys’ introduction disastrous? They sell loads of them, even down here in Sussex and they’re delicious! Way back then, they sold virtually none. Might be different now. Just driving past Ecclefechan as I type. My family didn’t believe me when I mentioned there was a tart named after the place. Thanks for settling the debate and giving us some interesting facts for our journey! I live in Ontario, Canada. One summer I lived in Jackson’s Point above a summer bakery. They made something called Eccles Cake, which were single-serving tarts, Very rich – I couldn’t let myself have one very often. I wonder if this is the same recipe. I will try it and see, although it was many years ago.